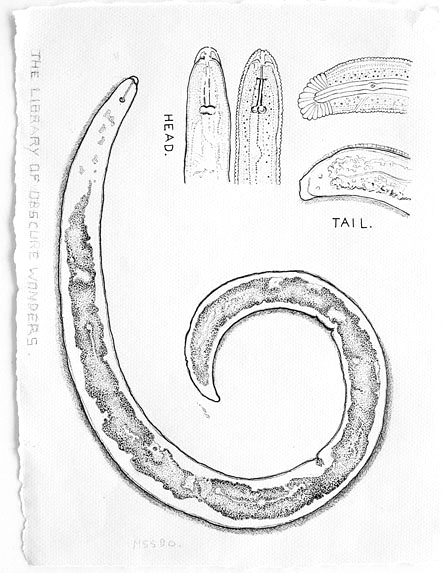 Pen drawing of a nematode worm by JV Roberts. One in every 8 creatures is a nematode worm. Several years ago I undertook a painting commission for a Scientist at Cancer Research UK. I remember he took me on a tour of his laboratory and on casually looking down a microscope I discovered these, nematode worms. They looked incredible! I could see their insides and watch their digestive systems in action. Although the Scientist’s information on his research into human blood cells was both fascinating and baffling, it is the visual memory of the beautiful nematode worms that sticks with me the most, and the knowledge that they’re everywhere and I never even knew they existed. A handful of soil will contain thousands of microscopic worms. Nematodes are the most numerous multicellular animals on earth. In size they can range from 0.3mm to over 8 metres (found in the guts of whales).Both parasitic and free living types exist and they live in almost every environment, from fresh water to oceans, mud, desert, the bottom of gold mines, it is rumoured that there is even a type of nematode that have developed to live in beer matts.